From Brazil to the Philippines, a number of power projects worldwide are integrating high-voltage, direct Current (HVDC) systems. The reason is simple: their proven track record. HVDC power supply systems tend to be economical and allow for stable bulk power supply across large areas, with minimal transmission losses. For example, the Leyte-Luzon Project in the Philippines (which integrates HVDC technology) has been instrumental in improving the stability of Manila’s AC network. Similarly, an HVDC system was used in India’s Rihand-Delhi Project to improve its stability and ensure minimal transmission loss. 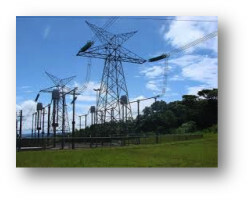 There are a few other key advantages to this technology, including its environmentally friendly nature and the fact that HVDC offers Asynchronous interconnections (i.e. power flow control). Direct Current (DC), which dates back to the late 1800s, is considered the first commercially generated electricity. However, DC came with one prominent disadvantage: it could not travel long distances. High voltage alternating current, also known as AC electrical systems, helped solve that problem. So where does HVDC come in? The technology serves one key function: it converts AC to DC electricity. Today, HVDC systems use Natural Commutated Converters to transform AC into DC, and vice versa. The power conversions are facilitated by a device called thyristor – a semiconductor capable of carrying extremely high currents (4000A). It can also block high voltages of up to 10 kV. Additionally, with the help of a thyristor valve, the DC voltage level can be adjusted. This specific ability ensures rapid control of transmitted power with remarkable efficiency. Another major component of an HVDC system is the Capacitor Commutated Converters (CCC). It offers the system many of its advantages, including feed of non-generating passive networks and autonomous control of active and reactive power. CCC valves that are made up of semiconductors, also known as Voltage Source Converters (VSC), have the ability to both turn on and turn off. There are three critical components to an HVDC system: a converter station at transmission and receiving endpoints, a transmission medium and last but not least, electrodes. A conversion station includes the necessary conversion equipment for AC to DC and DC to AC conversion: thyristor valves and VSC valves. All modern HVDC valves are insulated against air and water-cooled. The transmission medium is another critical component. It includes overhead line (i.e. solid and oil-filled cables) and is generally bipolar, which means two conductors with varied polarity. HVDC cables are used for submarine transmission of power supply. Solid cables, which are insulated with paper tapes soaked in high viscosity oil, are by far the cheapest. Alternatively, oil-filled cables are filled with low viscosity oil that works under pressure. HVDC cables, comprised of extruded polyethylene, are a relatively new addition. This type of cable is used in HVDC systems utilizing a Voltage Source (VSC) Converter. “VSC-HVDC can address not only conventional network issues such as bulk power transmission, asynchronous network interconnections, back-to-back ac system linking, and voltage/stability support to mention a few, but also niche markets such as the integration of large-scale renewable energy sources with the grid and most recently large onshore/offshore wind farms,” says Electrical and Electronics Engineers (IEEE) member Georgios D. Demetriades. A number of key factors have to be taken into account during the development of an HVDC system, including but not limited to the power that will be transmitted, the distance of transmission, voltage levels, temporary and continuous overload, status of the network on the receiving end and environmental requirements. The development of a large thyristor-based HVDC takes approximately three years. However, a VSC-based HVDC system can be completed in a much shorter amount of time (about a year). In addition to being able to carry more power than an HVAC system, HVDC technology has a number of other winning factors. For example, a bipolar HVDC tends to be more reliable compared to HVAC. Additionally, studies have shown that VSC-based HVDC system tend to be more economically viable. There are currently about 100 HVDC transmission systems in operation or in final development stages, accounting for 80 GW of power. The world’s longest power line, measuring 2071 km and extending from Xiangjiaba hydropower station to Shanghai is in development at the moment. It will use a 800 kV HVDC transmission system, proving this technology is here to stay. "Jeson Pitt is a professional electrician who spends much of his time sharing ideas with other enthusiasts on subjects like innovations in electrical technologies and power distribution."